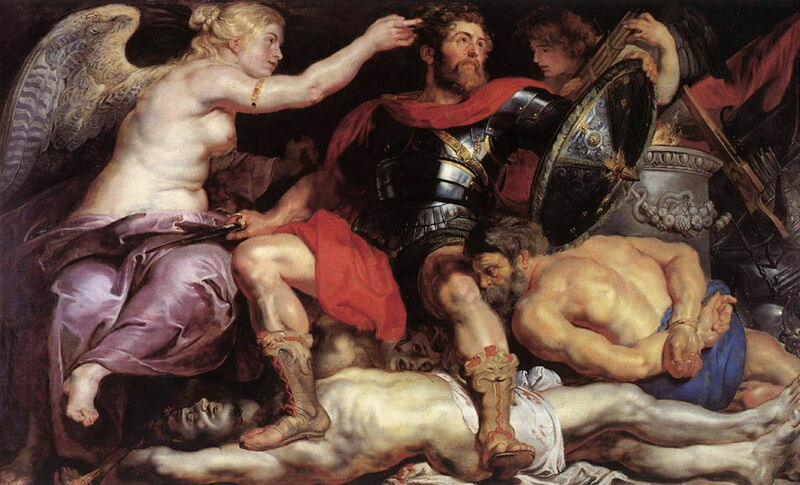 Peter Paul Rubens (1577–1640), The Consequences of War (1637-38), oil on canvas, 206 x 342 cm, Palazzo Pitti, Florence, Italy. Wikimedia Commons. In the previous article, I looked at Peter Paul Rubens’ (1577–1640) masterpiece Peace and War (1629-30) which he gave to King Charles I of England at the end of his diplomatic mission in London. Rubens returned to his busy workshop in Antwerp, and for the remaining decade of his life devoted himself to painting some of his greatest and most personal works. His personal life changed greatly too: when he returned to Antwerp, he married the sixteen year-old Hélène Fourment, having lost his first wife four years earlier. In 1635, he bought a country estate near Antwerp, the Steen, which was to be his base until his death, and the subject of several of his finest landscape paintings over those years. With Europe nearing the end of the Thirty Years’ War, Rubens was only too delighted to be commissioned to paint one of his final narrative masterpieces for Ferdinand de’ Medici, then the Grand Duke of Tuscany. Tuscany had been largely uninvolved in the war, and this time Rubens had no diplomatic mission to accomplish. He could afford to be frank in his story, and we are fortunate in having the artist’s own description of the painting as a reference. The central figures in The Consequences of War (1637-38) are Venus and Mars. The god of war is advancing forcefully having just rushed from the temple of Janus, moving from left to right, with his sword bloodied and held low. His head is turned back to look at Venus, whose left arm is caught around his right, and who is clearly trying unsuccessfully to restrain him. 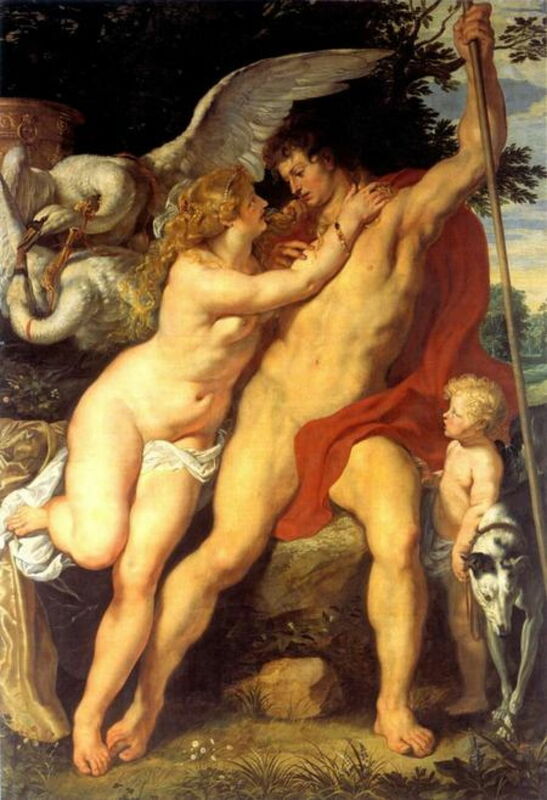 Standing against the right thigh of Venus is a winged Cupid, the child of Mars and Venus. Drawing Mars forward is Alecto, her hair now looking more like that of a Fury but with few snakes visible, who bears a torch in her right hand. Monsters near her personify Pestilence and Famine, the inseparable partners of war at that time. On the ground below Alecto is a woman with her back towards the viewer: she is Harmony, whose lute has been broken in the discord brought by war. Nearby, also on the ground, is a mother with her child in her arms, symbolising the effect of war on families and their rearing. At the lower right corner is an architect clutching his instruments, indicating how fine buildings are thrown into ruin by war. Under the right foot of Mars is a book, showing how war tramples over the arts. On the ground to the left of Cupid is a bundle of arrows or darts: these are not Cupid’s arrows of desire, but when bundled up would form the symbol of Concord; thus war breaks Concord. To their left is the caduceus and an olive branch, attributes of Peace, also cast aside. The woman at the left in a black gown is the personification of Europe, whose globe (symbolising the Christian world) is carried by a putto behind her. Having endured the ravages of war for so long, her clothing is torn and she has been robbed of her jewels. Venus and Mars are, in myth, well-known lovers. Venus is failing to restrain Mars from charging off to war, and in doing so, he is breaking their bond of love. This element of the composition had evolved over a long period, coming originally from Titian, and referring to another of Venus’ lovers, Adonis. Titian (Tiziano Vecelli) (1490–1576), Venus and Adonis (1554), oil on canvas, 186 x 207 cm, Museo Nacional del Prado, Madrid. Wikimedia Commons. 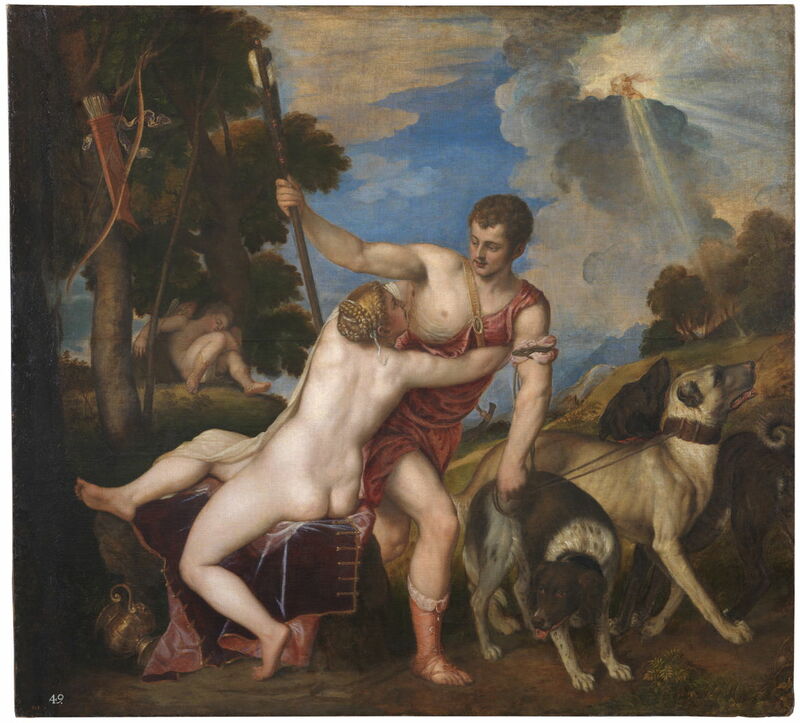 Titian’s Venus and Adonis from 1554 shows Venus trying, again in vain, to prevent Adonis from going off to hunt, where he was to be killed by a wild boar. This was a favourite motif of Titian’s: no less than seven versions have been attributed to him from the period between 1553 and about 1560. Peter Paul Rubens (1577–1640), Venus and Adonis (c 1610), oil on panel, 276 × 183 cm, Museum Kunstpalast, Düsseldorf, Germany. Wikimedia Commons. 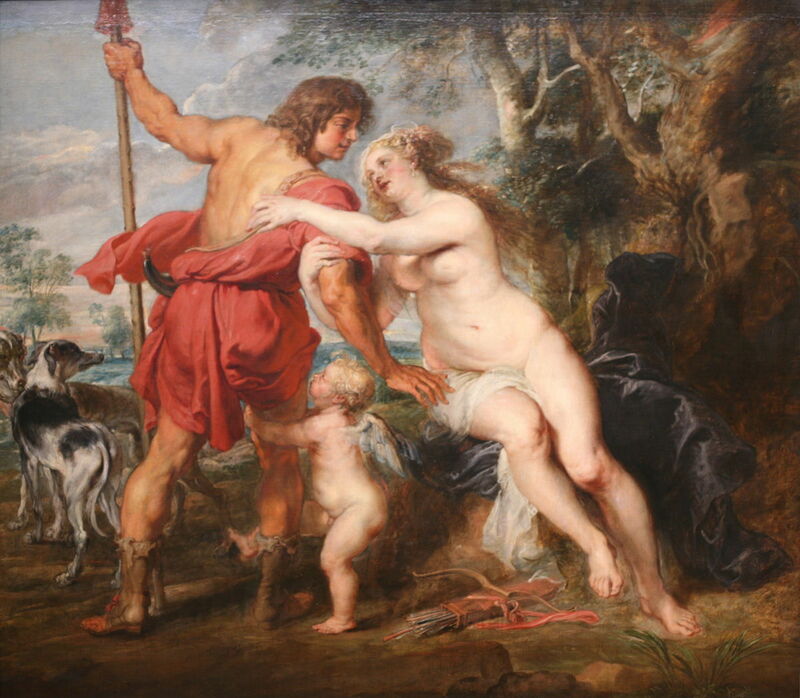 Rubens’ early painting of Venus and Adonis from about 1610, now in Düsseldorf, adopts a similar compositional approach, with Adonis facing the viewer and about to move to the right, but Rubens turns Venus’ body to face the viewer more. Peter Paul Rubens (1577–1640), Venus and Adonis (c 1635), oil on canvas, 194 × 236 cm, The Metropolitan Museum of Art, New York, NY. Wikimedia Commons. His much later Venus and Adonis from about 1635, now in the Met in New York, reverses the image (as if it had been made, say, from a print), and turns Adonis so that his back is towards the viewer. He is now about to move beyond the picture plane, away from the viewer. 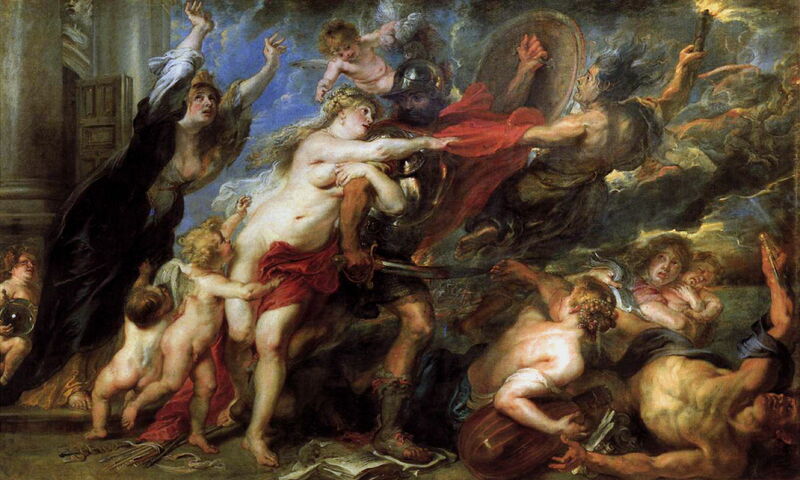 For The Consequences of War, Rubens keeps Venus in a similar position, but turns Mars to move straight along to the right – a more forceful and unconstrained action. 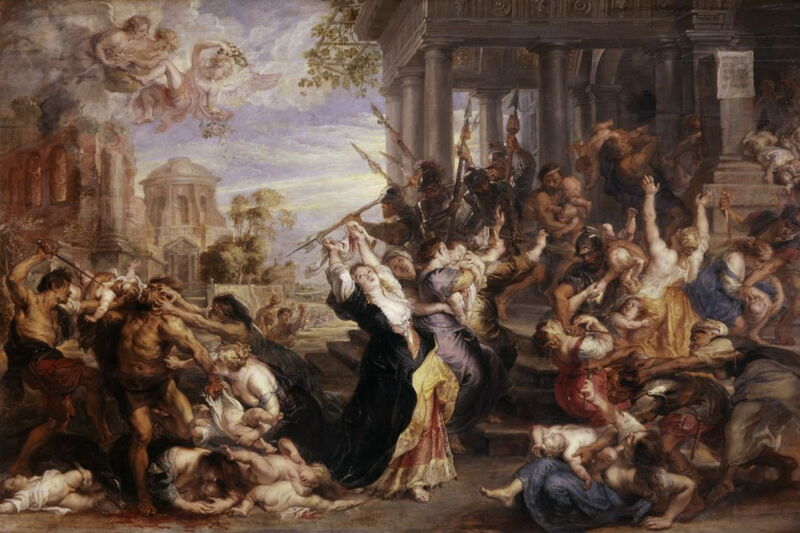 Peter Paul Rubens (1577–1640), The Massacre of the Innocents (c 1638), oil on oak, 198.5 x 302.2 cm, Alte Pinakothek, Munich, Germany. Wikimedia Commons. The figure of Europe has an even more contemporary reference, to a nearly-indentical woman in the centre of Rubens’ The Massacre of the Innocents (c 1638). She too is in distress, although here she is not a personification in the way that she is in The Consequences of War. Perhaps the most telling comparison is with Rubens’ The Triumph of Victory (c 1614), made when he was young, and the finest painter in Flanders. The Treaty of Antwerp had been signed in 1609, and the city was flourishing in the Twelve Years’ Truce which ensued. Peter Paul Rubens (1577–1640), The Triumph of Victory (c 1614), oil on oak panel, 161 x 236 cm, Gemäldegalerie Alte Meister, Kassel, Germany. Wikimedia Commons. Painted for the Antwerp Guild of St George, its organisation of archers, Mars dominates, his bloody sword resting on the thigh of Victoria, the personification of victory. She reaches over to place a wreath (either of oak or laurel) on Mars, and holds a staff in her left hand. At the right, Mars is being passed the bundle of crossbow bolts that make up the attribute of Concord. Under the feet of Mars are the bodies of Rebellion, in the foreground, who still holds his torch, and Discord, on whose cheek a snake is crawling. The bound figure resting against the left knee of Mars is Barbarism. Nearly a quarter of a century later, with the experience that his work as a diplomat had brought, Rubens had expressed a completely different view of war. His Peace and War (1629-30) and The Consequences of War (1637-38) should hang in the office of every head of state, from the White House, to the Kremlin Senate, to 10 Downing Street, and the Ryongsong Residence in North Korea. Lest anyone ever forgets. Posted in General, Life, Painting and tagged myth, narrative, painting, Rubens, Titian. Bookmark the permalink.